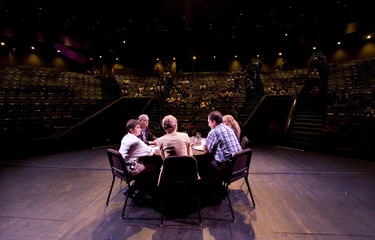 Prior to the arrival of the crowd, Suketu Bhavsar, Lori Hartmann-Mahmud, Sanford Goldberg, Nickole Brown and Kris Kimel began a wide ranging discussion on the nature of freedom at the Kentucky Center last Friday. I came in a bit late - several minutes after the crowd began to arrive, shown in this shot from Geoff, but captured three areas where there was some agreement, or at least not vocal disagreement over the nature of freedom. Any workable notion of freedom must have constraints - without disagreement, for example, there would be no advance in knowledge. Freedoms that aren't possessed by virtue of our very humanity quickly become problematic. Freedom cannot be the end result of a developmental stage dependent on the achievement of external factors - like security, for example - or the idea quickly breaks down. Conversely, collective, social or political notions of freedom are always a work in process. The desire for freedom can perhaps best be described as the desire for autonomy. Space Colonization: Where do I sign up? Hi again, this is Ben Thomas, a space geek who was excited to attend J. Richard Gott's session, 'The Space Colonization Imperative.' 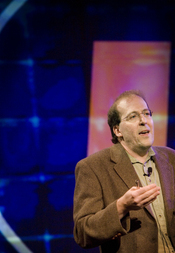 Gott is a Louisville native and is Professor of Astrophysics at Princeton University. His message focused on two central ideas: Why space colonization is important to the survival of the human race, and why we need to start. In 1969, Gott used the Copernicus Principal to forecast events such as when the Berlin wall will fall. His prediction of the wall only lasting 20 years ended up being a very close approximation. Later, he decided to apply this principal to more important questions such as the future of the human race. According to his prediction, the human species will only last 5001 to 7.8 million more years. We're uniquely intelligent, but this prediction is consistent with actuarial data of other species. The human race could be wiped out in a near instant if Earth was hit by a comet or asteroid. News flash: we don't have a backup plan! Space colonization is our only hope. The space program is expensive and highly technical. Gott pointed out that there is a great probability that we'll quit before we are successful in colonizing any other planet. It is already apparent that we haven't progressed as much as was predicted in the 1970's. "The goal of the space program should be to improve our survival prospects by colonizing space." What can we do about this? Gott proposed an interesting plan using mostly-existing technology to begin colonizing Mars. "Mars has all of the chemicals needed to have a self-supporting colony." Rather than focusing on how to bring astronauts back, we should find astronauts willing to stay. Gott repeated that colonization is possible and it is something that we should be doing. "Not colonizing Mars would be one of the biggest mistakes of the 21st century." If we as a human race decide to stay on Earth, we must understand "we are not special." There's a significant chance that we will not survive as a human race. Colonizing Mars is valuable because it will "double our chances of survival." "Space colonization is a challenge we should be willing to accept, and unwilling to postpone." Lee Dugatkin is a professor at the University of Louisville and the author of "The Altruism Equation," who has been researching the nature of goodness in people and animals alike for 20 years. As an aside, he says he feels like a kid in the conceptual candy store (my paraphrase), saying "that everywhere he looks, there's an idea he likes." He urges the audience to tell everyone they know about what's happening in Louisville. "In all good adventures, there is a mystery." In this case it's the question, "what is the nature of altruism?" He'll be sharing one main idea from his field, evolutionary biology. Showing a video of a squirrel alarming his neighbors to the predator nearby, he rhetorically asks why the squirrel exposes himself to danger for the benefit of other squirrels. If evolution is the tale of survival, why has this self-sacrificing behavior emerged? Altruism is not restricted to mammals, he suggests. Even slime mold, single celled creatures, cluster together to form a slug in times of peril and move as one. He shows a video of the production of "fruiting bodies" in slime mold in which other slime-mold "stalks" ladder themselves, which, crucially, will not allow themselves to reproduce, so that the rest of the might survive - even though there is no nervous system, no brain, it's an altruistic act. In Darwin's Origin of Species, the problem of altruism is one of the problems Darwin struggled most with. Why, for example, does the Honey Bee sting kill the bee? How could evolution, Dugatkin asks, develop a trait that, "when expressed, you die?" The answer, he suggests is that the bee is protecting the hive, its "blood relatives." John du Pre Gauntt works at Bellarmine University, at the Institute of Media, Culture and Ethics. He’s going to talk about the intersection of media, marketing, and mobility. John will discuss how advertising has changed since the times when advertisers knew where consumers are. And an industry audience is easier to market to than a general audience. What’s important is the flow of information and of people. The flow used to be based in a location or place, like your home TV or a billboard, but now you get rich media at home or in line at a store or on your phone. Media flow is wrapping around where people are, and everything else is subordinate to that fact. In essence: the one-way love affair / monologue between advertisers and marketers is over. Consumers are increasingly in command of where and how they consume media and marketing communications whether it is watching CNN in an elevator or reading newspaper articles in mobile web browsers. Location is becoming simultaneously less relevant and increasingly more important to maintain relevance between consumer behavior and advertisers and the communications used to connect the two. 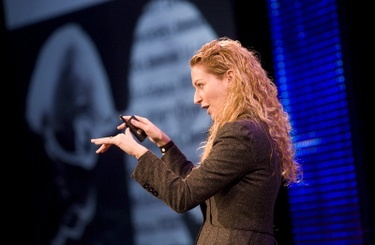 Jane McGonigal is speaking in the same space that the Louisville Competitive Game Conference was held just one week ago. She is the director of game research and development at the Institute for the Future. Games use a tremendous amount of intellectual energy by the people playing them. World of Warcraft has more articles written about it than any other subject or area, including Wikipedia. Economist Edward Castranova says we are witnessing a global mass exodus to an online environment. This is rational, according to Jane. Games are making us happier than real life. Games work better than reality for four reasons: better instructions, feedback, community, and emotions. Gamers feel strong emotions while playing, staying on the threshold of a breakthrough all the time, and studies show a strong connection there. And they feel extreme elation when they have a breakthrough or win an objective. Since there is no word for this feeling in English, Jane likes to use the Italian word Fiero. Fiero is the thrill of succeeding when something is really hard. She imitates the Fiero face, mouth open, arms in the air, eyes wide open, and gives out a little yell. Imagine a soccer player scoring a goal. Jane McGonigal: "Games are Happiness Engines"
Jane McGonigal says she's not interested in predicting the future, but in making it. She want's a gamer, or perhaps a band of gamers, nominated for a Nobel Prize by 2032. She hopes by the end of the session the we might envision that possibility too. Great quote: "Games are a vital material of the future." Sixty-five percent of households play video games. Eighty-eight percent of youth under 18 play games. Seventy percent of (what size?) companies use game to train employees. Average U.S. gamer is 35, which means that they're continuing to play games. It's not a fad. Forty percent of gamers are woman. Displaying a sign in a window she passes everyday that says "I'm Not Good at Life," she begins by saying says "Reality is Broken." It can be fixed by more and better games. Massively multi-player games provide instant feedback on performance. "Everything in this world is meant for me to do something with," which doesn't apply in the rest of life. World of Warcraft has 134,000 articles on the game and its world on the WoW Wiki. What other problems have that kind of brain power applied to them? People feel empowered in WoW. And people are literally moving to these places, a fact which Edward Castronova, who is an economist, says is a very rational behavior based on the benefits received: This environment makes people happy. Christopher Hauck has created an impressive video installation, taking up the entire room on the second floor, of images of the Berlin Wall. He is attempting to communicate to viewers some of the concepts and experiences surrounding the "what was once a divisive barrier and icon of disruption, the Berlin Wall." (Idea Fest site). The exhibit includes floor to ceiling structures of wall studs and thin fabric, graffiti and writable paper walls, and many powerful projectors showing video of the Berlin Wall and first person account of experiences. He put together the whole exhibit in just two days, and has to disassemble it in two hours Saturday night. The initial concept for the project was to install five partial recreations of the Berlin Wall around Louisville, but Christopher had trouble getting funding and sponsorship for this intriguing concept. Instead, he was able to get assistance from the Idea Festival and some other local organizations and businesses for a scaled down, interior version of his concept. The installation was planned in detail before the Idea Festival, but the pieces really came together while constructing in the space. The result is an intentionally cacophonous experience, with multiple videos and audio tracks playing and visible through the fabric walls at the same time. The idea is to at first be overwhelmed, and then focus your attention to one person’s story told through video. The thin, translucent walls are a metaphor for how the walls around us can be overcome. And at the end of the maze of walls and videos, comes a writable paper wall where anyone can leave their own comments and experiences. Christopher Hauck is originally from Louisville, Kentucky, and now lives in Atlanta, Georgia where he runs his Creative Studio there. More information about him can be round at his website, www.christopherhauck.com. His exhibit, called “[de]construction. Wall Art – Defining a Post Berlin Wall Culture,” is scheduled to move to Fulton, MO, San Francisco, CA, and Atlanta, GA, and details of each location can be seen at www.thewallart.com. The exhibit was also brought to life with the assistance Louisville native and resident Theresa Carpenter Beams, who heads up Essential Media. Bios of both Theresa and Christopher, and more information about the project, can be found at www.thewallart.com bio page. If you haven't seen the exhibit yet during the first two days of the Idea Festival, please make it a point to stop by for the final day, Saturday, September 27. It's free, and well worth the experience. In a short film shown before she speaks, it is clear that what happened was an organized and planned slaughter. 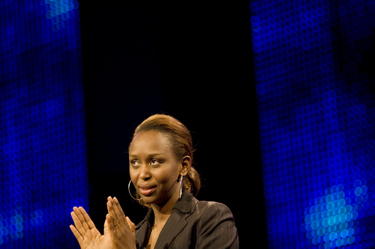 Imaculee Ilibagiza arrives to a standing ovation, and opens by expressing astonishment that she would be asked to share her story at a festival of ideas. She begins by saying that she has arrived after much heartache, to "a state of forgiveness." So what happened, this genocide, she asks. In a country that is very small, many people live. Whoever decided to divide the country left it with two tribes, Tutsi and Hutu. Leaders in the country pitted the two tribes against each other. She says that she didn't realize she was Tutsi until she was an older child when asked to identify herself, she stood with members of both tribes in her school. In one moment, she remembers things would change. Her older brother came to her with the news that the president, a Hutu, had died in a plane crash. Rumors spread. The radio said told people to stay home. People started coming to her home by the hundreds and after a short while, her father asked her to go hide. She says she left home "out of obedience." One glance back told her that this would be the last time she should would see them. She stops to plead with the audience to not to generalize regarding people. The man who sheltered them in a bathroom did not even tell his own children they had unanticipated visitors. He brought them food from the garbage to eat. The entire time, she had to be quiet. After three days she had become very angry, and tried to talk herself into the ways she might kill the people hunting her. She began, she says, to pray to God that he might spare her one day, "then we can talk." That day, home invaders entered the home and searched for hours for any evidence of Tutsi's. One person literally had his hand on the door before releasing the knob. The experience turned her toward her faith in God - and in a copy of the Bible she had in the bathroom, she found lessons in forgiveness everywhere she looked. Holding up a Rosary, she explains how it tells a story. It, too, stresses forgiveness. For a time, she laughs, she left out that part about forgiving others, but after a time slowly started to add that part back in, "asking what can this mean?" She begged God to help her to forgive and concluded that her anger was interfering with her ability to reason. That moment changed her profoundly. Forgiving, she emphasizes, does not accept what is wrong. "Apologies belong to them, forgiving belongs to you." She determined that once she emerged from that bathroom, a prison of three months, she would be a different person. She weighed just sixty-five pounds when she finally came out. She emerged to find that everyone she had loved had been killed. One million people - "there were bodies everywhere outside." Dogs were eating their flesh. She says that was determined to "not to crash" and leaned again on her faith. Nothing could change what had happened, but she could do something. Sometime soon after leaving her hiding place, she also later faced one killer, who tried to stare her down and recounted how she began on the spot to pray for him. He face very slowly softened - very slowly she says - and he eventually walked away still holding his machete. But there was the matter of finding work, which she describes as a lengthy project that concluded in a wrongful hiring. The person who hired here mistook her for someone who had died. Turning to her book - a second one is just out - she says that it did not take long to write about the lessons she learned and recounts the story of meeting many, many people who have helped her tell her story. Her first book was New York Times best seller in only two weeks. She concludes by saying that no matter what happens, you can find joy in your heart. "It is there." Jonah Leher is up describing why art and the brain are meant for each other. Why is art meaningful? He believes it can to a degree be "reversed engineered," but not as he ultimately concludes below, completely understood. Early thinkers believed that music was about melody, prettiness and its appeal to the soul. Showing pictures of hairs cells, which are on YouTube, he goes on to explain how the brain hears. The brain, he points out, searches the cacophony of sound that it is always receiving for patterns. As for music, "it is a form whose meaning depends on its violation." A musical section in the Rite of Spring, from Stravinsky, caused a riot because it hinted at, but never quite delivered, the pattern the mind was expecting. But why did it, he asks, become a classic? For that he turns again to what we know about the brain. The corticofugal network reorganizes itself in response to new inputs, and eventually learns new patterns, which in addition to showing the plasticity of the brain, can make previously unappealing music not just acceptable, but meaningful. Fast forwarding, he says that Kanye West inserts the same lack of certainty in the patterns in the music he uses. It's a tease. "Kanye West is playing with your brain." Girl Talk, which he plays next, takes the resulting tension to a new level. He concludes that a purely chemical view of the body isn't, of course, what makes us human. Art has the ability to aid our brain in turning experience into meaning. One of the wonders of the neuroscience is that the one reality we all experience is the one we can't explain. One questioner asks about how abstract art should be compared to representational art. The brain, he explains, is constantly filling in reality, and that's why abstract, non-representational art, can succeed. It engages the brain in a way that representational art can't. He adds that "the art that stays with us is the art you struggle to hear." How, another asks, can the arts move science forward, faster. In an interesting reply, he says that the rigors of the scientific process can be helped along by using art to inform our questioning - we can ask better questions. Responding to a question about an "objective reality," he says that "the brain isn't interested in a perfect representation of the world, but in having that world makes sense." We use expectations to modulate reality, which, in turn, can affect bodily sensations like pain. And experiments bear this out. The more we learn about the brain, the more mysterious the mind becomes. We all have, yet can't explain, the first-person experience.